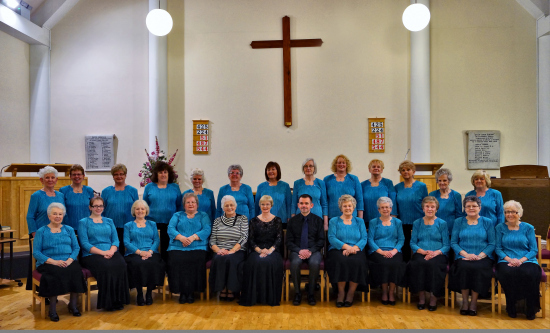 The choir was formed in May 1981 and six months later made their concert debut at the Gwyn hall Neath, with the band of the South Wales constabulary. The choir does a lot of charitable work, and has help raised funds for various charities, the choir has appeared in concerts in England, Ireland, Holland, and many parts of the principality. also Lenny Henry Goes to Town. They have shared the stage with the Morriston Orpheus, and Pontarddulais male choirs, exchanged visits with the Wexford, South Woodham Ferrers,and the Park hall male choirs, also the Stoke-on-Trent male voice choir, the Neath ladies inspired the ladies of both Wexford and South Woodham Ferrers to form choirs of their own, and the three ladies choirs have also met up to perform tri-choral concerts in Neath, Essex, and Ireland.